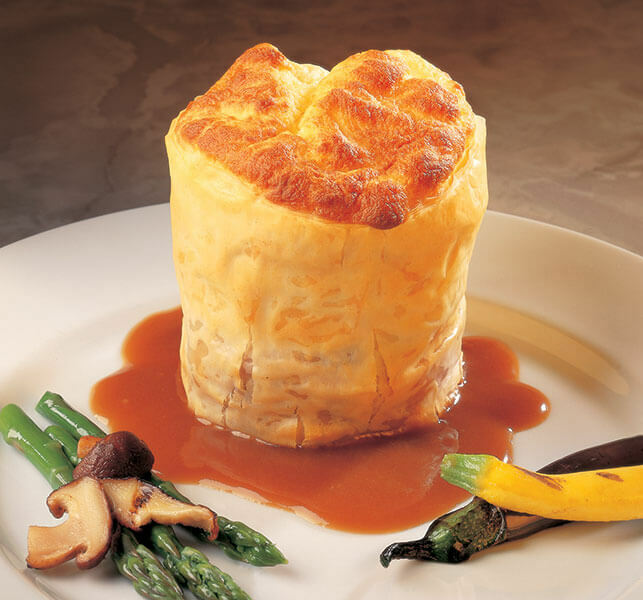 Flavorful veal tenderloin is wrapped in flaky phyllo and accompanied by sauteed mushrooms and onions in this elegant entree. In saute pan, over medium heat, melt butter. Add onions and mushrooms. Saute for 7 to 8 minutes, season with salt and pepper. Cool. Season veal with salt and pepper. In large, heavy skillet, heat oil on high until smoking. Carefully brown veal, turning as needed. Cool. In small bowl, beat eggs and water to make egg wash. Prepare 8 medium Phyllo rolls according to directions for rolls linked to the right. Turn veal tenderloin roll on edge to form tube. Brush with egg wash to seal seams. Fold one side of Phyllo tube under to enclose veal; leave other side open. Stand veal on closed Phyllo tube bottom so open end is on top. Spoon mushroom mixture onto veal. Top with Cheese Souffle mixture. Bake on greased baking pan in preheated 350°F oven for 20 to 30 minutes or until golden brown. Serve with Madeira Sauce and grilled vegetables. Perfect for elegant holiday entertaining, this strudel features shiitake mushrooms, Granny Smith apples, cream cheese and Brussels sprouts, all spiced and wrapped in flaky phyllo.